Yesterday I had the pleasure to meet one of my C-R-A-F-T Yahoo Group friends: Jenny Hall from New Zealand. What a lovely lady. 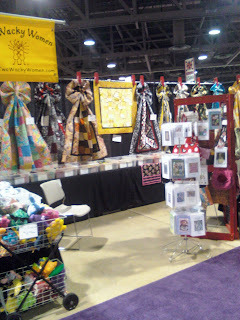 One of her reason's to visit Long Beach was to go to the International Quilt Festival. Jenny stayed at the Hyatt next door to the convention center and I met up with her about 11:00 AM on Monday. Sadly, we only had a short two-hour visit. However, we had a great time. 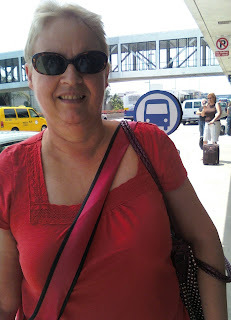 We met and had a cup of coffee and I drove her to the Los Angeles Airport where she was heading to meet her two oldest children who are currently living in London. The world has become such a small place especially with the advent of the Internet and all the on-line groups. I have been able to meet and visit with Yahoo Group friends from Switzerland, Australia, Washington, Virginia and now New Zealand. If I missed any, forgive me. I have mentalpause. I hope I get to meet many more of you. It's Monday and the Long Beach IQF is over for another year. The show went far smoother this year. For those who went to the show last year, you know what I mean. We have such a good time at these shows, visiting with all our quilting friends, and meeting new quilting friends. What's not to like? The quilts were wonderful, the 450 vendors all busy; but, by this morning, I found myself exhausted. I plan on doing nothing at all tomorrow and the next day. At least that is what I am saying today. I fully expected to sleep for two days. However, I have a to-do list and I found myself peeking at it a few minutes ago. So I am thinking I will probably start on it soon. I met up with a Yahoo Group Pal from New Zealand. I'll post about that tomorrow. I love my groups. Can you believe it? Yes, the Grommet Bag is done, finished, over. And, I love it. Putting in the grommets was really quite simple. The hard part was remembering to have them. Frankly, I never actually picked them up. 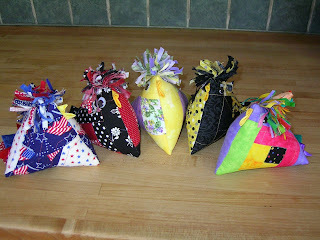 It was Robin who handed them to me one morning as I dropped by her house on my way to some place. 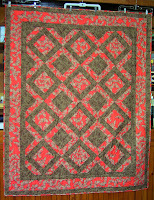 This is my final sample for the International Quilt Show in Long Beach this week. At least I think it is. Hope to see you there. Our booth number is 1333 - 35. 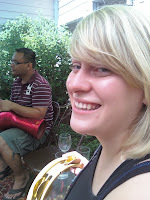 My granddaughter, Annette, goes back to Idaho tomorrow. What fun we have had. We saw Harry Potter the 2nd day it was out; we shopped for new clothes the next day. One day Annette was such a big help to me by setting up my new laptop computer and helping me with some Two Wacky Women stuff. Today we went to the Farmer's Market at the Marina in Long Beach and then on to a cooking/music fest called Summertime in Turkey. We had a great time and learned to bang on drums and eat very healthy and delicious Mediterranean food. I finally got those quilts quilted and bound. 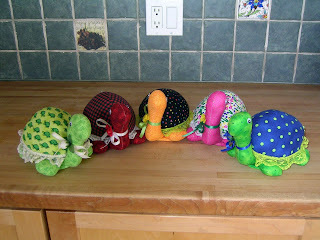 We need them for the International Quilt Festival next week in Long Beach. Two I did on the machine using invisible thread and the blind hem stitch. The small guy I did by hand because it was fast and it was idiot proof and something to do in front of the TV. 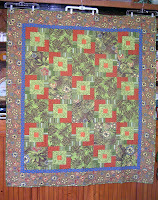 Two Wacky Women will have kits for each of these quilts: Monach Magnolia Lane, Brazilia, and Simba Spotlight. Looking forward to seeing you at the show. My daughter and her family were here for a short visit on their way from Hawaii to Florida, their next home. We managed to work in a trip to Hollywood to see the movie UP. When I was young, all new movies opened in Hollywood and often stayed there for months before going out to the suburbs. So most of us ventured into Hollywood to see movies, like The Godfather or Bullet. 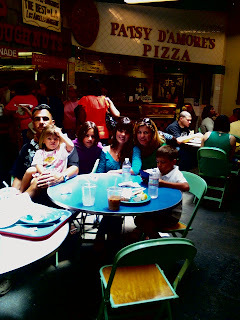 Our next stop was the Farmer's Market in West LA. One of my favorite places in all of Southern California. It is celebrating its 75th anniversary and 40 years ago I had lunch there nearly every day. I worked across the street from it. So, while the quality of this picture leaves a lot to be desired; it is precious to me. I was able to share a bit of my past with my grandchildren. Do Pigs have to be Pink? Who says a pig has to be pink? Or a turtle green? Oh chickens can just be any color. 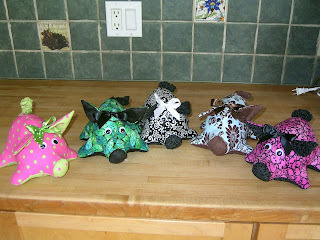 TWW will be selling these and more at the Internation Quilt Festival in Long Beach later this month. Aren't they just too cute. In case you are wondering if we make these, the answer is no. 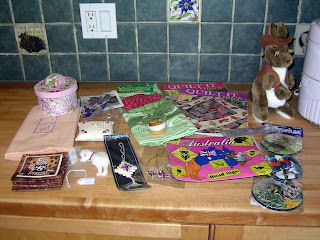 It's July.................that means I can now open my Christmas in July from Diana in Oz. Ooohhh, I am a lucky girl alright. Just look at my stash. That fabric is dyed with the red soil from the town in Australia where Diana was born. (Where is that Diana?) It is gorgeous. Several projects jump into my mind right away. Thank you so much Diana; what a fun 1st of July. Oh, it is Canada Day, right? Happy Canada Day.